My three year old (four in October) is starting school. She is so excited to be going to school like her big sisters, she can hardly stand it. Her sisters have been running a school for her in our basement for a couple of years. They call it ‘learn and play.’ She has a desk and they use the chalkboard to teach her letters and numbers. Lately they have been teaching her how to spell her name and French vocabulary. She has been going to pick up and sometimes drop her sisters at school all her life. Now she finally gets to graduate from basement playroom learn and play to the big time. She is now a big kid who goes to school. 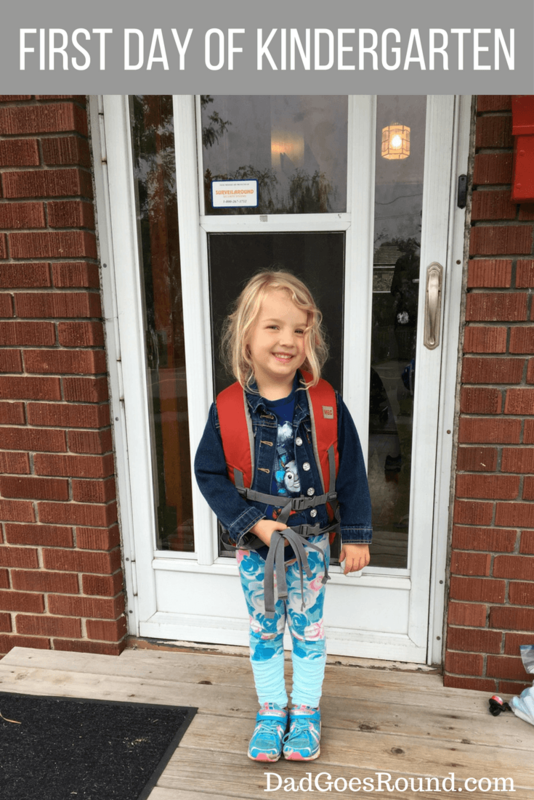 All week she has been saying that she is a kindergartener now. She has been marking the days until she gets to go to her first full day. We went for an hour and a half small group integration earlier in the week. She played with play doh and ignored the other kids who were there. Her teacher briefed the parents (all the other dads were there too) on what her days would look like. She is in French immersion like her sisters so she will have alternating days in English and in French. With the exception of the month before she was born, this will be the first time in almost 11 years where there will be no kid at home during the day. It is going to seem weird. My partner has been working as the full-time stay-at-home parent all of that time. I had the opportunity take parental leave after the first two were born and for the past eight years have had jobs where I can work from home very regularly. Since I have been working from home most or all of my kids’ lives they are great about leaving me to work when I have my work computer set up. Now I will be working without the Paw Patrol soundtrack playing in the background. I won’t need to apologize about the sounds of kids playing in the background when I’m on a conference call. The biggest change will be for my partner. She will spend her days doing whatever she wants instead of having kids hanging off of her. She doesn’t know and doesn’t need to know what comes next. I think the next few months will be a time of rest and recovery. She can sleep her days away and try to catch up on some of the past 11 years of sleep deprivation. I look forward to whatever she decides to do next. Whatever it is, she’ll be amazing. So now we move on to the next stage of life as a family and as parents. Having all your kids in school is kind of like having your kids all out of diapers. It comes with a certain kind of freedom. In this case we don’t need to pay for day care anymore. We were only doing it part-time, but the bills add up nonetheless. We no longer need to figure out what to do with our youngest if I need to be at the office or in a meeting and my partner has to work or has an appointment. We will both (theoretically) have more energy when the kids are home from school because they won’t have worn us down during the day. So now we move forward, with three big kids, who, for now are excited about school and the new year ahead of them.